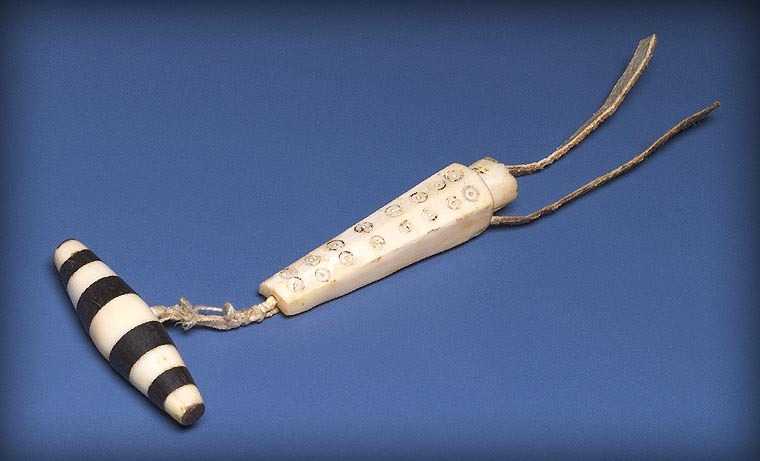 Needle cases gave the male Inuit carver much opportunity to exercise his skill and express both his sense of aesthetics and his devotion to his wife. These cases served as essential tool kits for Inuit women's never-ending work of sewing and repairing clothing. A case consisted of a cylindrical or rectangular hollow tube, which held a piece of skin into which the precious needles were stuck. This was attached to a thimble holder, which was usually a bird's wing bone or a toggle. Carvers used either bone or ivory and decorated them according to the local tradition. While Inuit in Labrador, the Baffin region and the Keewatin used ivory to construct the centre part, the Copper Inuit used caribou leg bone. 1901  The Eskimo of Baffin Land and Hudson Bay. Bulletin of the American Museum of Natural History. Vol. XV, p. 94. 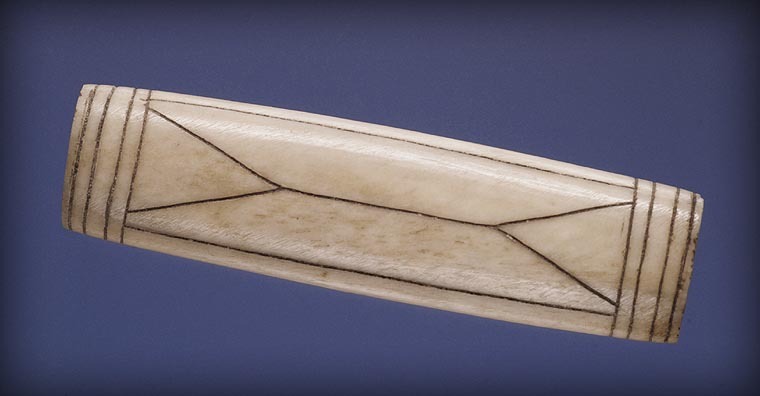 The passion of the Copper Inuit for symmetry is evident in this elegant central part of a needle case. An almost identical needle case is illustrated in Birket-Smith's report vol.V of the Fifth Thule Expedition. 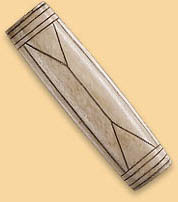 * As with Leden's needle case, it was acquired from the Kenipitu, whom Birket-Smith refers to as the Qaernimiut. 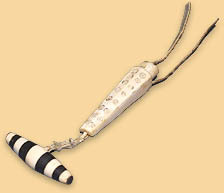 The circle and dot motif can be found on various objects  such as combs and parka ornaments  in Christian Leden's collection. 1929	The Caribou-Eskimos: Material and Social Life and their Cultural Position. Vol. 5, Pt. 1-2, Report of the Fifth Thule Expedition, 1921-24, ill. p. 248.